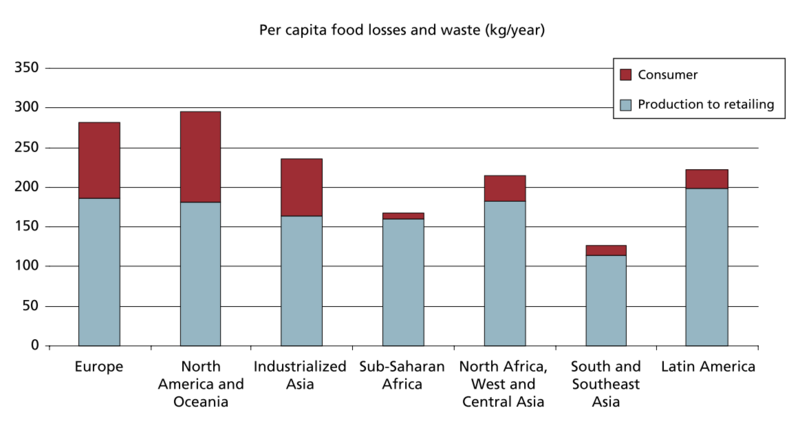 Food loss and waste (FLW) has become a highly visible global issue. The United Nations set a target under Sustainable Development Goal 12 – responsible consumption and production – to reduce by half “the per capita global food waste at the retail and consumer levels and reduce food losses along production and supply chains, including post-harvest losses”.1 How FLW is defined is important for measuring the extent of the problem and taking action on the Sustainable Development Goal target. Currently there is no agreement on an FLW definition. The Sustainable Development Goal target uses the Food and Agriculture Organization (FAO) definition for FLW. Broadly, the FAO defines FLW as a reduction in food quantity or quality.2 Food waste is a part of FLW. Food waste refers to food that is in good condition to be consumed, but has been discarded by choice or because it has been left to spoil. Typically, food waste occurs at the consumer level, such as in hospitals, restaurants, and homes. In the United States (U.S.), the United States Department of Agriculture Economic Research Service (USDA ERS) defines FLW as the edible part of “food available for human consumption that is not consumed for any reason”.3 Again, food waste is a part of FLW, and can include food discarded by retailers and consumers. The USDA ERS does not measure FLW before the retail stage. Post-harvest food loss is food removed from the supply chain at any point between harvest and consumption stages. The post-harvest stages are unique to different food products and contexts. Therefore, post-harvest food losses are broad in scope. The causes of FLW around the world are context-specific, and depend on the country, conditions, products and practices. Generally, the causes are different between developed and developing countries.4 The causes among different global regions are often related to the value chains stages where most loss occurs. However, there may be upstream causes of FLW that are not seen until later on in the value chain. Producing larger quantities of food than is needed results in extra products that may be diverted to other uses (such as animal feed). High consumer ‘appearance quality standards’ (e.g. size, shape, color) for fresh products may cause supermarkets to reject produce or farms to reject products and divert to other uses. The cost of discarding products is cheaper than using or re-using during food processing where foods are trimmed to the desired shape and size or errors during processing result in the wrong appearance, and products are often discarded. Supermarkets carry large quantities and varieties of products to meet consumers’ expectations to shop a wide variety of items. As a result, there is a greater chance that products will reach their “sell-by” date and need to be discarded. Depending on the country or state, food date labels may or may not be an indicator of food safety. With the abundance of food, a general attitude exists that people can afford to waste food. Harvesting crops too early before they are acceptable for consumption, resulting in loss of quality, nutritional value and profit. After harvest, food loss can occur because of poor storage facilities, including cold storage, and lack of infrastructure (g. buildings, roads and power). Not enough processing facilities to process and preserve fresh produce. Insufficient market facilities that provide acceptable storage and retail conditions. Unsafe food that does not meet minimum food safety standards should be discarded. The end use of the product will depend on the cause for the food becoming unsafe for human consumption. Sustainable food systems provide enough safe and nutritious food for all people in a way that protects economic, social and environmental resources for the food security of future generations.5 FLW threatens these resources and the sustainable food production, negatively impacting food security and nutrition for current and future generations. The economic costs of FLW include the cost of the food itself that is lost or wasted, the cost of inputs (e.g., for production, transportation, storage), and loss of income. People whose livelihood depends on food value chains, such as farmers, traders, processors and retailers, may lose income from FLW because they have less food to sell or they have to spend more on inputs to have more product to sell. FLW may increase the price of food for consumers. Also, consumer food waste means loss of money that consumers spent on their food purchases. In 2010, the USDA ERS estimated that 132.9 billion pounds of food was wasted at retail and consumer levels in the U.S., totaling $161.6 billion U.S. in food cost.7 Figure 3 shows the breakdown of waste and cost by food group. The final destinations of discarded products have different environmental consequences. 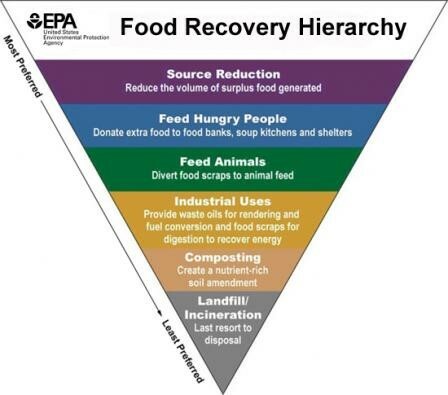 The U.S. Environmental Protection Agency’s (EPA’s) Food Recovery Hierarchy, Figure 4, ranks FLW management strategies from most to least preferred. FLW impacts food security by reducing the availability of food at global and local levels, access to food either from reduced income or increased food prices, and natural resources available for future food production.5 Nutritional quality and the food groups that are most vulnerable to FLW are closely linked. Animal products (e.g. meats and dairy products), fruits and vegetables are vitamin and mineral-rich foods that are also the most perishable food groups. Therefore, diet quality may be affected by reductions of important sources of vitamins and minerals. Strategies to reduce FLW and work towards Sustainable Development Goal target 12.3 include infrastructure development, market improvements and innovations, public awareness, and legislative action. One challenge is the limited evidence on the effectiveness of these different interventions. Future research on strategies for FLW reduction will provide valuable information on what works. National and local governments have legislation already in place and are introducing new legislation to address some of the major causes of FLW. Goodr: A surplus food supply chain that redirects excess food from businesses to non-profit organizations that serve the food insecure. Businesses can track their donations, which can be used for tax savings. Food Cowboy: Using location-based technology to connect food donors (food companies or catering companies) with non-profit organizations that serve the food insecure. Also provides paperwork for tax benefits. OLIO: Platform that connects households or businesses with surplus food to other users or donation charities. Users wishing to donate food, upload a picture of the product, brief description, and pick-up location. USDA FoodKeeper: Provides information on food storage, safety and cooking to use food while at its peak quality and reduce food waste. 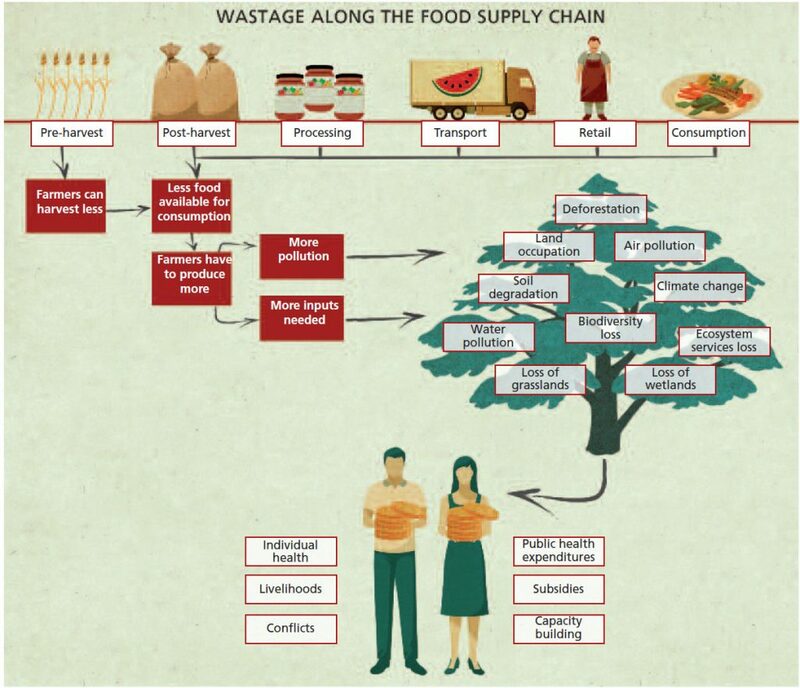 Take a quiz on food loss and waste! United Nations. Transforming our world: the 2030 Agenda for Sustainable Development. A/RES/70/1, (2015). Buzby, J. C., Wells, H. F. & Aulakh, J. Food Loss – Questions About the Amount and Causes Still Remain. Food Choices & Health (2014). Available at: https://www.ers.usda.gov/amber-waves/2014/june/food-loss-questions-about-the-amount-and-causes-still-remain/. Buzby, J. C., Wells, H. F. & Bentley, J. ERS’s Food Loss Data Help Inform the Food Waste Discussion. Statistic: Food Choices & Health (2013). Available at: https://www.ers.usda.gov/amber-waves/2013/june/ers-food-loss-data-help-inform-the-food-waste-discussion/. Feeding America. Protecting Our Food Partners. Available at: http://www.feedingamerica.org/about-us/partners/become-a-product-partner/protecting-our-food-partners.html. Shabazz, S. Farm, Fork and Food Waste. National Congress of State Legilatures (2017). Available at: http://www.ncsl.org/research/immigration/farm-fork-and-food-wast.aspx. H.R.5298 – Food Date Labeling Act of 2016. Available at: https://www.congress.gov/bill/114th-congress/house-bill/5298/actions. H.R.344 – Food Recovery Act of 2017. Available at: https://www.congress.gov/bill/115th-congress/house-bill/3444?q=%7B%22search%22%3A%5B%22H.R.+3444%22%5D%7D&r=1. French Food Waste Law Changing How Grocery Stores Approach Excess Food. All Things Considered (2018). Available at: https://www.npr.org/sections/thesalt/2018/02/24/586579455/french-food-waste-law-changing-how-grocery-stores-approach-excess-food. Maeda, R. Japan feed animals recycled leftovers. Reuters (2008). Available at: https://www.reuters.com/article/us-japan-food-recycled/japan-feeds-animals-recycled-leftovers-idUST21465920080723. A new market for old and ugly fruit and vegetables takes shape. The Economist (2018). Available at: https://www.economist.com/news/finance-and-economics/21734399-far-too-much-ends-up-wasted-new-market-old-and-ugly-fruit-and-vegetables. World Food Programme. Recipe For Disaster. Available at: https://cdn.wfp.org/2018/recipe-for-disaster/. Obi, L. The eco-friendly way to preserve mangoes. Daily Nation (2018). Available at: https://www.nation.co.ke/business/seedsofgold/Introducing-the-cool-way-to-keep-fruits-fresh/2301238-4307874-15f3qbaz/index.html. Kane, C. Could these apps solve America’s huge food waste problem? Fortune (2015). Available at: http://fortune.com/2015/04/16/could-these-apps-solve-americas-huge-food-waste-problem/. Ramanujan, K. Dial up food storage, cooking advice with FoodKeeper app. periodiCALS (2015).